There's no chance you'll be staying home with the itinerary we've put together for the weekend ahead. And the best part? We're one step closer to summer! 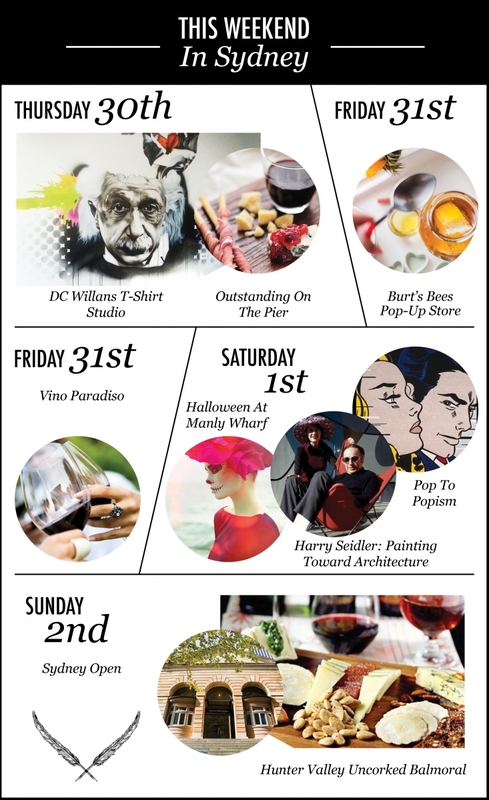 Featuring three incredible art exhibitions, a Burt's Bees pop-up store, Vino Paradiso festival and a spooky Halloween party at Manly Wharf, there are plenty of fun things to do in Sydney this final October weekend. Crowd favourite, Sculpture By The Sea, is returning to Bondi this year and boy is it bringing the goods. For its 18th annual exhibition there will be an array of creative structures that will leave you in a state of wow. Staged along the Bondi to Tamarama coastal walk, Sculpture By The Sea is a great excuse to get some culture with a touch of sweat and vitamin D! So what are you waiting for? The exhibition will be running from 23rd October until 9th November 2014. For more information see their website. Controversial airbrush artist, DC Willans is making some positive waves this weekend with a pop-up art studio in Broadway Shopping Centre. Swing past and take a look around at the various artistic airbrush designs DC has to offer that are sure to tickle your fancy. You can even get DC to make a personalised shirt for you – how cool! And the best part is, it's FREE! But you better be quick as there are limited slots available for freebies. Did someone say giant BEES?! Don't worry we aren't talking about ginormous killer bees, but the Burt's Bees pop-up that is setting up shop at Westfield Sydney in Pitt Street Mall. This multi-award winning skincare range will be buzzing with excitement with unique honeycomb display cases and interactive product testing areas. Visitors will even receive free samples of the Burt's Bee's Radiance range – sounds sweet as honey to us! Get stuck in from 27th October to 2nd November from 11am daily and keep checking back each day for new offers and surprises. For more details see here. An International Food and Wine Festival? Count us in! Vino Paradiso is a three-day festival that was made for food and wine enthusiasts. Kicking off this Friday, feel free to wander through an array of pop-up bars, stalls and secret alleyways and discover the simple luxuries you didn't realise you were missing out on. With grape crushing, a treasure hunt, competitions, giveaways, an Instagram photo booth and free samples, you're in for a treat this weekend. For more information and to purchase tickets head to the Vino Paradiso website. Trick or treat? We all know what Halloween meant growing up; a countless supply of lollies and dressing up in the scariest outfit you could get your grimy little hands on. Things have changed quite a bit since then. But Manly Wharf is keen to bring back the excitement of All Hallows Eve, replacing the sweets with complimentary cocktails and epic dance music. Head down this Saturday night and receive your complimentary spooky cocktail on arrival and dress up for your chance to win some awesome prizes! This killer party will kickoff at 6pm until late, so mark it in your calendar and make sure you don't miss out. For more details head to their website. Calling all art enthusiasts! Head to the Museum of Sydney this weekend and prepare to be inspired. The museum will be hosting an exhibition with never before seen works from talented architect, Harry Seidler. Also featured will be his countless collaborations with the biggest names in art, architecture, design and engineering. Co-curators Vladimir Belogolovsky and Dr Caroline Butler-Bowdon will even be holding a talk at 2pm this Saturday to answer all your questions about the exhibition. For more information and to buy tickets head to the Sydney Living Museums website. For more cultural things to do in Sydney this weekend, re-live the 1960s pop-art revolution with Pop to Popism! The exhibition traces the origins of pop art and is said to be one of their most ambitious exhibitions ever! Pop to Popism will consume an entire Gallery floor and feature over 200 works, including masterpieces such as Roy Lichtenstein's In the car and his first-ever comic-style painting Look Mickey, Andy Warhol's Triple Elvis and David Hockney's Portrait of an artist. So why not pop over to the Art Gallery of NSW this weekend for a pop art experience like no other? See their website to purchase tickets. Sydney city is open for inspection. Sydney Living Museums will be hosting walking tours of our beloved city this Sunday. It's time to "unlock your city" and see just how beautiful it is inside and out. With 50+ buildings and a wealth of architectural history, Sydney Open is definitely a unique thing to do in Sydney this weekend. It really is an art-filled weekend and we couldn't be more excited! For more information head to the Sydney Living Museums website. It's the one event we have booked on our calendar for the following year the day after it finishes and this year is no different! Join the fun at Balmoral Beach esplanade this Sunday for the 9th annual Hunter Valley Uncorked festival. This is your opportunity to indulge in the taste of the Hunter Valley, the sights, the stories, the people and of course the wine! The festival will run from 11am – 5pm this Sunday only. For more information click here. If you're lucky enough to get the afternoon off for Melbourne Cup, make sure you meander down to The Bucket List. Their 3 hour package includes Pommery on arrival, drinks packages, canapés, live music and, of course, the big race! So why not enjoy the sunshine, the magnificent view and hopefully walk away with a bit of money in your pocket. Bookings are essential. To purchase tickets head to The Bucket List website.